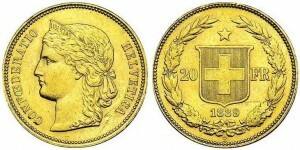 The gold coinage of Switzerland between 1883 and 1949 includes coins of 10, 20 and 100 francs corresponding to the criteria adopted by the Latin Monetary Union. Let’s look in detail starting with the first cut output, as well as the most common: the 20 francs. The 20-franc coin was minted from 1883 to 1949 and is the most widespread, having been produced in 58,634,296 pieces. To know the value of the most common years see this page, at “Marengo” line. Obverse: bust of Liberty with diadem and laurel wreath, and legend CONFŒDERATIO HELVETICA. On tiara there is legend LIBERTAS. Reverse: Swiss coat of arms surmounted by a star and surrounded by a wreath of olive and oak. Year. 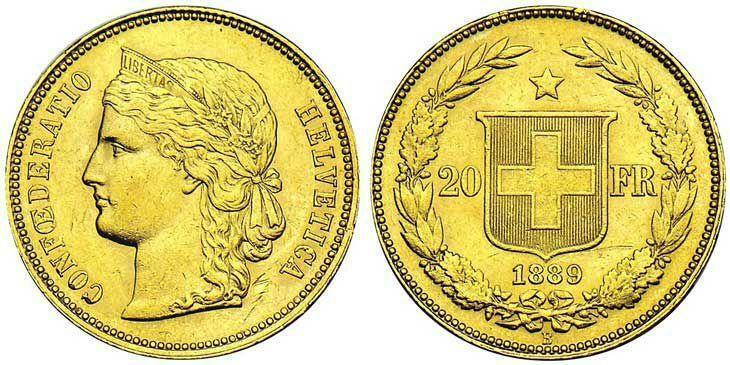 This type of gold coin was engraved by Eduard Durussel and presents the edge written DOMINUS *** PROVIDEBIT ********** (with the exception of coins dated 1883). “Gondo gold” means the gold from the mines of Gondo (canton of Valais), a mountain village south of the Simplon Pass, near italian border. Already at the time of the Romans in the area of Gondo was mined gold. Between 1660 and 1691 the mine Gondo lived his best years, thanks to the family Stockalper. The mine went bankrupt in 1897. 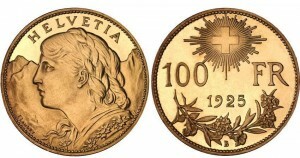 The coinage with Gondo gold are characterized by a lighter color and are especially recognizable for punching a small cross at the center of the Swiss cross. Because of this limited number of pieces (25 in 1893, 19 in 1895, 29 in 1897) obviously the value is high, the low circulation has led some authors to consider these coins as patterns. Coin engraved by Fritz Ulysse Landry (1842-1927). Obverse: bust of a young woman (Vreneli), with bridal hairstyle; collar decorated with edelweiss; mountains in the background. At the top, HELVETIA; at bottom right engraver’s signature F. LANDRY. Reverse: Swiss coat of arms placed on branches of oak and surrounded by the legend 20 FR. At bottom, date and mint mark B (Bern). Vreneli is the diminutive of Verena, who is the personification of Switzerland. Identity of the model is uncertain: it may be Françoise Kramer-Egli (1859-1946) from Neuchatel, but also Rosa Tännler (1878-1946) from Gadmen (Oberhasli). When it was created, the coin of 20 francs was normally used in trade, but in 1935 the value of gold content exceeded the nominal 40%: a 20-francs coin had come to be worth 28 francs. For this reason the issue was suspended. Coin dated 1935-L deserves a closer look. It was minted from 1945 to 1947: they were minted 3,500,000 in 1945, 7,108,813 in 1946 and 9,400,000 in 1947. In these coins date 1935 highlights that coins had the same amount of gold as those minted before the devaluation of the franc, which took place in 1936. Coins minted in the postwar period are easily distinguishable from those produced in 1935 thanks to the letter L (stands for Lingots) that appears to the left of the year. The Eizenstat Report, prepared by the United States government in 1997, claimed that between 1939 and 1945, Germany moved to Swiss National Bank gold bars confiscated in many European countries, for a total value (estimated in 1997, and today much higher) of 4 billion dollars. In particular, the report insists about problem of gold stolen from Jews and other political opponents murdered by the Nazis, fanning the hypothesis that part of that metal (especially gold teeth) and then was used after the war for minting Swiss gold coins. This view was also supported by a British television, that analyzed two gold coins minted after the war and there he found a content of mercury (used in dental amalgams) higher than normal. In reality these charges, in addition to not be provable, are also inconsistent, just think that in 1945 the U.S. military found as many as 20 tons of “gold of the dead” in Germany, in the salt mine of Merker (Thuringia). This gold had not been recast: the Nazi government did not dare to entrust the staff of the mint objects so incriminating; most of gold coming from the concentration camps has never been put into circulation. Also in July 1946, the control of the finances that recorded for the issue of vreneli 1935-L mint has only used lingots in his possession before the outbreak of war. 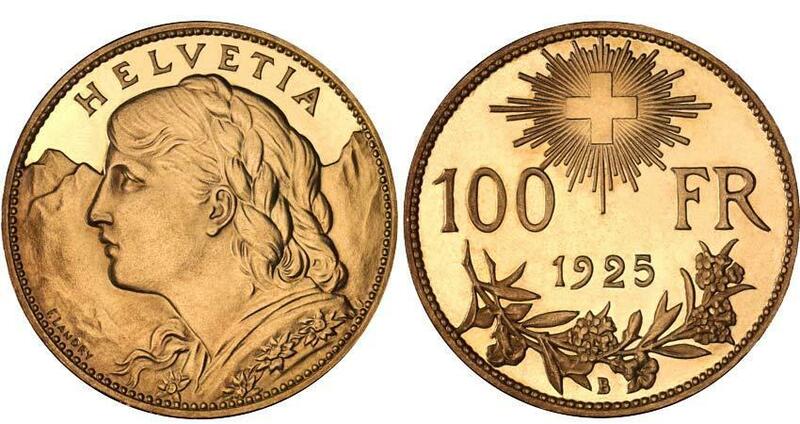 Detractors of Switzerland also questioned the dating of coins: why the year 1935 in coins issued ten years later? To get them to pass as “clean” coins? Those who put forward these criticisms forget that the 20 francs minted from 1945 to 1947, as already mentioned, are easily distinguishable from those produced in 1935 thanks to the letter L. What is certain is that currently the gold stolen from the victims of the Nazis spread in gold reserves around the world, including the United States and other allied countries. Reverse: at top, Swiss coat of arms in a crown of rays of light. At the center, 10 FR legend. At bottom, intertwined, a sprig of alpine rose (Rhododendron hirsutum) and gentian. Year and mint mark B (Bern). Reverse: at top, Swiss coat of arms in a crown of rays of light. At the center, 100 FR legend. At bottom, intertwined, a sprig of alpine rose (Rhododendron hirsutum) and gentian. Year and mint mark B (Bern). 100 francs coin was minted in the year 1925 in 5.000 pieces only. Buonasera ho ricevuto in regalo una medaglia diametro c.a. 4cm con impressa la scritta “Agricultura Helvetica” da un lato e “Neuchatel 1887” dall’altro. Vorrei sapere se avete maggiori informazioni e se potete fornire un valore indicativo. Iscrivendoti alla newsletter ti verranno segnalati tutti i nuovi articoli pubblicati, nonchè quelli aggiornati con nuove informazioni. Riceverai una sola e-mail a settimana, che viene spedita la domenica. - Quanto valgono le monete in lire ?